Set for Washington DC, you see the 10 South Solar Eclipse rising in the chart for Aug 1, 2008, at 6:12:30 am edt. The fact that the Eclipse is on the ASC–exactly–greatly personalizes this Eclipse for our nation’s capital and whatever issues the Eclipse brings to the surface will affect our government and the politicians who infest it. 10 South is also the Pre-natal Eclipse Series (PE) of: Virginia Woolf (Jan 25, 2882), Merriwether Lewis (Aug 18, 1774), Robert Schumann (June 8, 1810), the NYSE (May 17, 1772), and the Discovery of Neptune (Sep 23/24, 1846.) Some suicides are in the bunch, as you see. This is also the PE of presidential candidate John McCain–and of Condi Rice! It will be surprising if its influence doesn’t affect McCain’s prez bid between August and November unless his current campaign finance hypocrisy continues to plague him, or other skeletons don’t begin to rattle too loudly. This current manifestation on Aug 1, 2008 will conjunct the natal Mercuries of: George W. Bush, the Republican Party, and Alberto Gonzales and is also the PE of the November presidential election. Makes you wonder what Rove has up his sleeve, doesn’t it? 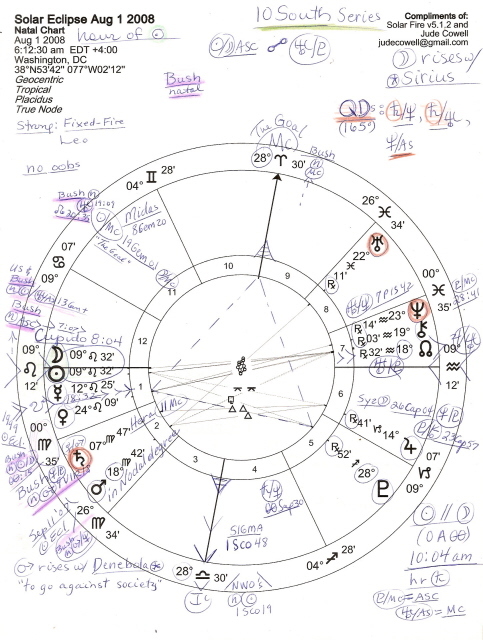 I will be checking this Eclipse against the candidates’ charts asap, so stay, as they say, tuned. And here’s my post with chart image of the August 16, 2008 Lunar Eclipse which I related to “market paranoia”…and then some, as it turned out.